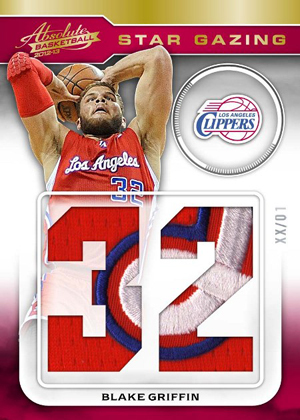 The Bottom Line: 2012-13 Panini Absolute Basketball represents a big step forward for the longstanding brand. After taking a few steps backwards following Panini's acquisition of Donruss, Absolute is back in a big way in 2012-13, sans the "Memorabilia" part. This reinvention largely follows the path blazed by the 2012 release of Gridiron Gear, another popular perennial offering in Panini's, which dropped the "Gear" this year to reflect a more autograph-centric checklist. As was the case with 2012 Gridiron Football, the change from Absolute Memorabilia to simply Absolute isn't just skin deep - it represents a paradigm shift in the product's content by offering 3 autographs and 1 memorabilia card per box. Considering the diminishing interest in game used memorabilia cards as viable, sought-after hits, this is a smart move by Panini that makes Absolute a much more palatable option for basketball collectors. Not only are there more autographs per box, the autograph lineup is as varied as it is impressive. In addition to featuring autographed rookie cards of both the 2011-12 and 2012-13 NBA rookie classes, there are a multitude of NBA star autographs and cool multi-signature combinations, not to mention a wide range of NBA Hall of Famers. The only downsides of 2012-13 Panini Absolute Basketball are the steep price tag and the overall drop in the quality of memorabilia cards. I wouldn't classify these shortcomings as egregious, but they do have enough of an impact to make what would have been an excellent product a very good product. 2012-13 Panini Absolute Basketball is a great looking all around set. Very few of the subsets disappoint, but there are clearly a few that stand out above the rest. These include the serial numbered Retired Player portion of the Base Set, Iconic Autographs, Private Signings, Star Gazing Jersey Patches and the incredibly rare (and incredibly cool) Every Player Every Game Patches. It would be nice to see fewer sticker autographs in the product, and the foil used in some of the cards tends to show damage rather easily. But these aren't enough to diminish this great looking basketball card set. The only thing this checklist is missing is Michael Jordan, and since Upper Deck has an exclusive license with him, it's not exactly something we can hold against Panini too much. 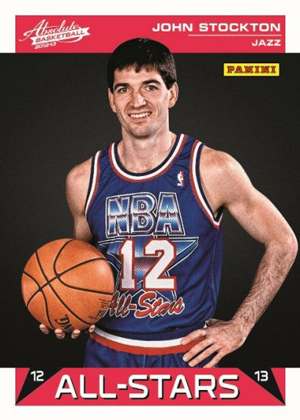 Instead, let's concentrate on what we do have to look forward to in 2012-13 Panini Absolute Basketball. First and foremost are autographed rookie cards from both the 2011-12 and the 2012-2013 NBA Rookie Classes, including the likes of Kyrie Irving, Bradley Beal and the king of the uni-brow himself, Anthony Davis. Many Veterans, All-Stars and Hall of Famers are also well represented in the set. And they aren't simply relegated to inserts and jersey cards. There are tons of big name autographed cards in the set, including the likes of Kobe Bryant, Larry Bird, Scottie Pippen, David Robinson, Dr. J, Bill Russell, Magic Johnson, Kevin Durant, John Stockton and Blake Griffin - and that's just the tip of the iceberg! Make no mistake about it, this product isn't cheap. Hobby boxes are going for upwards of $150 at this point in time. However, there are a massive amount of big autographs to score in the product. 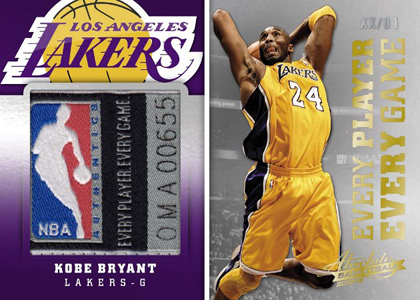 The subjects featured in the set cover such a wide spectrum of NBA players that there is virtually something for every collector in 2012-13 Absolute Basketball. If you can afford to shell out the cash and are looking for an exciting basketball card experience, Absolute should be high on your list of products to purchase. The 2012 Olympics reignited my interest in basketball. But up until now I hadn't found a new basketball card release that really resonated with me. Thankfully Absolute Basketball changed that. I had a great time breaking the box, and while I didn't pull any particularly impressive hits, the product provided enough value, big hit potential, and cool inserts to justify the cost of admission. 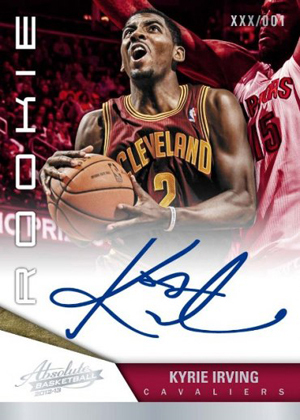 2012-13 Absolute Memorabilia HOBBY Pack (Kyrie Irving Thompson Auto Relic RC)? Like rookies? Autographs? Low-numbered memorabilia cards? 2012-13 Panini Absolute Basketball has them all. The hits-focused set has a 250-card base set that includes 100 autographed rookie cards. Like all 2012-13 Panini basketball products, both the 2011 and 2012 draft classes are a part of the rookie checklists. Rookies are all hard signed directly on the card. The base set also has three parallels: Gold, Platinum and Black. Every 20-card box (four packs of five cards) of 2012-13 Panini Absolute Basketball has a minimum of three autographs. Signature inserts include Frequent Flyers Autographs, Heroes Autographs, Hoppla Autographs, Iconic Autographs and Marks of Fame Autographs. Collectors can also look for Frequent Flyers and Iconic cards with swatches of game-used memorabilia. All game-used cards in 2012-13 Panini Absolute Basketball are serial numbered to 99 or less. Most are much less. Among the memorabilia card highlights is Every Player Every Game Patches. Each card has the complete serial numbered patch from a game-used jersey. Did not produce the guaranteed number of GU’ed within the case, and of the GU’ed, quite a few were poor, for this level of product. Also the Auto range of stars in the product could have been much better, rather than flooding the product with RC autos of low end RCs. Indicative of the Garbage that Panini keeps shoving down enthusiasts throats. I am finished with Panini. What a Joke. 2012 13 Panini Absolute Basketball Box - Hobby - 4 Hits!!! 2012-13 Absolute Factory Sealed Basketball Hobby Box Kyrie Irving RC?